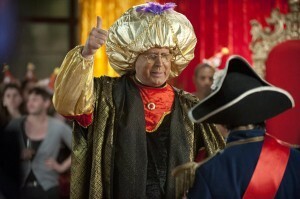 Derek B. Gayle reviews the second installment of Community's three-episode finale from May 17. Well, we’ve all probably already heard the news about Dan Harmon’s ousting as showrunner for next season. At risk of over-editorializing, I’ll save any sentiments about that for “Introduction to Finality,” as it’s effectively Harmon’s swan song. Since most of us watched these episodes without definitive knowledge of his departure, let’s forget about the news for a moment and instead dive in to the Chang-heavy penultimate episode of the season. Back in the Chang arc, the group shows a promotional video to Officer Cackowski to prove that the real Dean isn’t at Greendale. However, Cackowski doesn’t believe them, and says if he catches any of them at Greendale, they’ll be thrown in jail. The group investigates the school while Chang’s child security force is planning his birthday party. Troy goes to the A/C Repair Annex for help, and Murray tells him that Dean Pelton is being held in the basement of the cafeteria. He gives Troy the details about where the guards are, what the security is, and that they need the key around Chang’s neck. He also says they’ll need help from the A/C Repair school…but only if Troy agrees to join (meaning he has to move into their housing, can’t have friends or a relationship, and can’t use the word “sensational” for some reason.) Troy declines, and the group decides to plan an elaborate heist to get in. Out of options, Troy alerts the A/C Repair Annex via the security camera. They turn off the fan, giving the group a place to escape. Dean reveals he’d been renting the schools out to raves, so they activate the music and strobe lights to distract the guards so Troy and Abed can get to the fireworks and stop the detonator. Chang arrives, and he and Jeff prepare to fight with tasers like lightsabers. The school board, who were present at the party, witness this, also having found the two Deans slap-fighting in the hallway. Chang and Doppel-Deaner run off after the school board catches on to the mayhem, and the board realizes they’ll be fired for how much ridiculousness happened under their watch. Dean Pelton, however, says he’ll cover up what happened for the sake of Greendale. Murray arrives to get Troy, who delivers his goodbyes to his friends. He arrives at the repair school to Vice Dean Laybourne’s open arms. “The First Chang Dynasty” is probably the weakest of the trifecta of finale episodes. 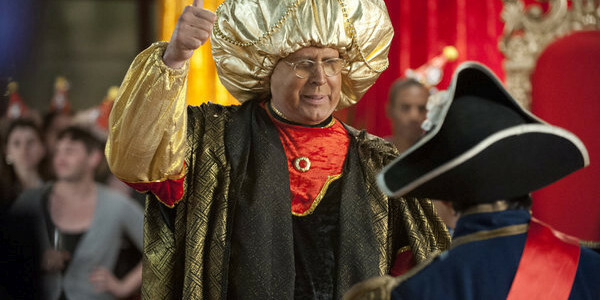 “Digital Estate Planning” was a fun novelty, and the following episode has strong emotional resonance, but “The First Chang Dynasty” is just kind of…there. That’s not to say it’s unimportant—after all, this is the climax to an epic story we’ve been moving toward at a brisk pace since “Basic Lupine Urology” (and had seeds planted for it back in “Contemporary Impressionists” and even the season premiere.) However, it definitely suffers from being aired between the other two on the same night, and as a result is overshadowed and surprisingly forgettable despite its importance to the narrative. But scheduling aside, even, part of this is probably because the Chang arc works best when it isn’t right at the forefront. It’s provided a really great backdrop for the latest progression of episodes, but focusing on the characters’ antics and interactions mask what’s really an utterly ridiculous story arc. We love Community because it’s willing to go to those ridiculous places, sure. But when that story does become the forefront, with all the children and gothic magicians and fireworks—it all just feels, well, ridiculous even by Community standards. It’s still entertaining and very funny overall, so it accomplishes that goal, but it doesn’t provide it with much merit outside of a couple of moments. 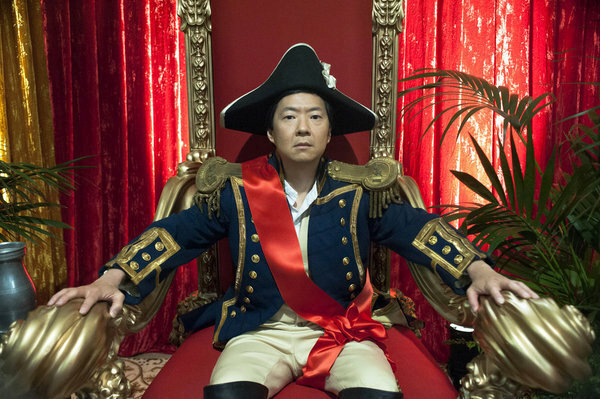 As funny as Ken Jeong is, Chang’s the hardest character to really break down. He’s been so all over the place since his introduction that there’s really no way to say anything except chalk him up to “crazy.” Consider how unexpectedly close he got to the study group in season 2; it’s really strange to think of he and the group being on tolerable terms this time last year. Even this season he and the group have been good to each other, like in “Geography of Global Conflict” or to an extent, “Origins of Vampire Mythology.” Again, we’re probably meant to just agree that he’s totally crazy—which even I admitted was obvious when they had to point it out in “Curriculum Unavailable” (and I guess I can better see why that sequence was necessary in that episode now.) He’s always very funny—especially his strange puns and dialogue—but in a show filled with surprising complexity, he’s the odd man out for being a regular cast member. Even if that’s the point, it also means an episode with him at the center will inevitably be all over the place emotionally. So, again, it’s not that anything about this episode is awful, it’s just not really interesting by Community standards because of the focal character. On the complete opposite side of the spectrum of Chang’s backwards development is Troy, a character who’s received a massive amount of growth since episode 1. Donald Glover got some good moments in as the A/C Repair subplot came to a head; as funny as he is, he’s managed to play serious moments just as adeptly. I’ve said numerous times that Troy’s main progression throughout the show is simply becoming an adult, and it’s plenty clear here seeing him make big choices for the sake of his friends (and in this case, their lives.) It’s also worth nothing that his initial reaction even before the heist was to say yes to the sacrifice, and that lack of hesitation is a good indication for how far his character has come. His goodbyes at the end, though brief and not too insightful, were still emotional. Britta giving a lock of her hair was funny, and Troy’s whisper to Abed, which they know is annoying when people do it in movies, were all nice touches. Character stuff aside, crafting this into an Ocean’s 11 heist parody was brilliant. We got some very nice use of tropes—what with the constant “I’m in!” and the “voiceover of the planning spliced with the action being executed” thing heist and spy movies love doing. Murray visualizing but not vocalizing where the key is was also a particularly funny play on the trope. I especially loved the obvious “failing was part of the plan”—even though their plan would have worked just fine without it, and they failed anyway. Like all of Community‘s good concept episodes, it all works because of the attention to detail and adept knowledge of the tropes. The set and costume designs were very well done—Jeff and Britta’s much-publicized goth outfits, especially. The performances were also funny, particularly Troy and Abed’s plumber antics. Though the heist concept is executed effectively and the story is well-plotted, this episode’s weak point is how hard it is to care about what’s going on. Sure, we don’t want our characters to die, and we do want to save Greendale, but the tension doesn’t overcome the inherent lack of depth Chang and his motivations have. 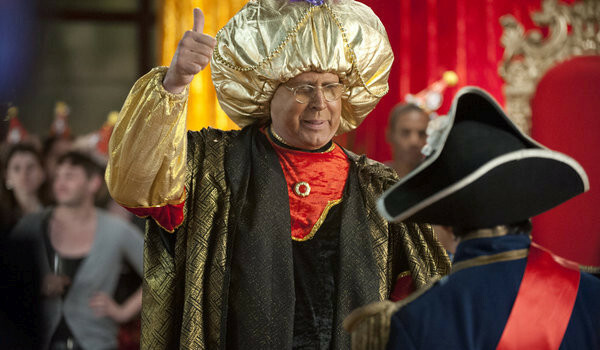 But of course, like every other less-than-excellent episode this season, the antics are still entertaining and the jokes are still funny. Not up to par with Community‘s best, and disappointingly devoid of much emotion (save Troy), but it still holds up structurally and delivers the laughs. Jim Rash is pure gold, as always. I particularly loved him asking if anyone paid his rent, his reaction to Britta rescuing him, and especially his reaction to Jeff touching him. And his Jeffrey doll was adorable! Upside of so much Chang and Dean in the plot? The puns—Deanelchanger! I absolutely love the girl’s creepy song for Chang at his party. Craig Cackowski is just a treasure. The “Copera” bit and “thanks for the hot water” were great. Britta’s “Look, I hate cops!” from that teaser was also gut-bustingly funny. Community fanatics probably appreciate the reference to Chang eating his twin sister in-utero (ew)—Dan Harmon has noted in the DVD commentaries that this was actually going to be a plot point explaining his sometimes-split personality in season 2, oddly enough. I love the group’s awkward attempts to turn around when Chang cuts them off during his escape. I wish J.P. Manoux got more screentime as Doppel-Deaner, based on his moments like not knowing how to spell Craig, or his wife getting her braces removed. “Looks like J-Swag’s going Deep Dish!” – Is that really how kids talk today?